Authentic Wood-Fired Neapolitan Pizza From an Ice Cream Stand? Don't judge a book by its cover. Along a busy section of River Street in Plains lies what looks to be an intriguing looking ice cream stand called Sprinkles and Shakes. It's a quirky looking building with a ton of character, like many roadside ice cream shops, but a recent trip to the restaurant proved it was anything but just an ice cream stand. I first heard about S and S when they were a part of my annual NEPA Pizza Madness Tournament and did quite well. I follow every restaurant in Northeast Pennsylvania that serves pizza (I'm a dork like that), so naturally I sought out their facebook page and gave them a like and checked out there pics. 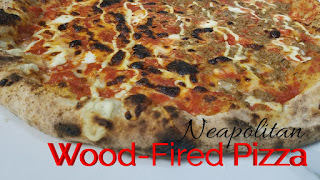 I was surprised to see mouth-watering looking wood-fired pizza that I knew I must try one day. The Wilkes-Barre area tends to be a bit of a hike for me so opportunities are limited, but I had business in the area, so I called up and ordered a pizza. When I arrived, I introduced myself to the owner, who by the way is a really awesome guy, and he gave me grand tour. 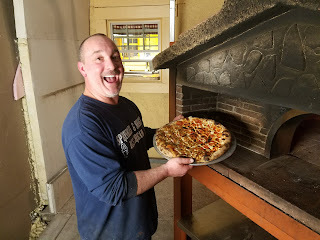 I got a behind the scenes look at the incredibly nice wood fired pizza oven and learned quite a bit about the pizza. Check out the YouTube video below for that behind the scenes footage (Subscribe to my Youtube Channel!). 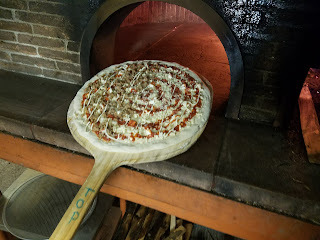 First, I learned that the dough is aged for 4 days before using and that Barton, the owner, worked tirelessly for months to perfect his recipe and methods in making this pizza. I always say that some people take the art of pizza making for granted, because anyone can make a pizza, but it takes a lot of work to become a real pizza maker. Making a great fresh dough pizza requires finesse, dexterity, knowledge, and experience. Making a Neapolitan pizza in a wood-fired oven requires a ton more knowledge, experience, and practice. Getting the wood to burn properly, heating and maintaining the oven at the proper temperature, and cooking times under 2 minutes make wood-fired pizza far more challenging than a gas or electric oven. I was impressed at how adept Barton was with the process in such a relatively short time. 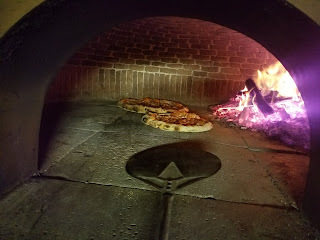 I had a blast seeing how the whole process worked and marveled at the gorgeous pizza oven with the giant dome and I didn't have to wait long until my pizza was ready. I paused for a second, because I started to realize that I was on the verge of doing what I have always wanted to do - have a behind the scenes pizza show (minus the look for tv, camera crew, on-air personality, and budget, of course!). I was very grateful for the opportunity that Barton had provided me, but also excited to try the pizza. As you can see in the video, I found it to be very, very good. 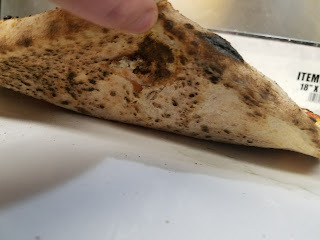 The crust had a nice smokey flavor that wasn't overpowering with some slight charring that really added depth of flavor and texture. The dough had a very nice chew and tenderness to it. It was very light, but had enough density to support the chunky and flavorful sauce. There was a pleasant sweetness to the sauce that contrasted the smoky dough and the rich cheese blend. This pizza was equal parts savory and satisfying and the crushed meatballs were also excellent. Overall, I really enjoyed this pizza and I have to recommend it to the NEPA Nation. You probably wouldn't expect great pizza coming out of what appears to be an ice cream stand, but Sprinkles and Shakes offers way more than just ice cream. They have a full menu including their famous potato pancakes. Wood-fired pizza is rare here in Northeast Pennsylvania, so do take advantage of this hidden gem and order a Neapolitan pizza to try today!